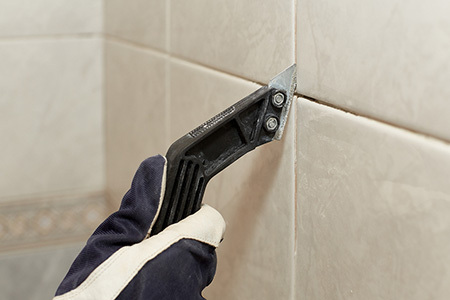 Why not let an experienced handyman handle the repairing and replacement of tile grout for you? Damaged grout in a tiled floor or wall can be a real letdown, especially if the property doesn’t need a major renovation. Grout lines in tiling often become discoloured and sometimes the material can crack or fall out. Luckily, Handyman Near Me provides grout repairing and replacement services to handle the cracked and discoloured filling. Our skilled professionals will find the most inexpensive and fast way to fix the problem leaving your tiled floors and walls in an impeccable condition. Enjoy a quick and efficient grout repair and replacement by booking the best handymen in London! The causes for the damaged filling between the tiles could range from a lack of expansion joints to poor quality grout mix, to movement of the tiled surface. If the damage is concentrated in the floor walkways, the likely reason is floor movement or deflection. Although the ultimate solution is to stiffen the surface, Handyman Near Me offers a much simpler repair. We can abrade the filling to remove stains and improve its appearance, or if needed we can clean off some or all of the damaged material from the affected area and replace it with a new high-quality grout.